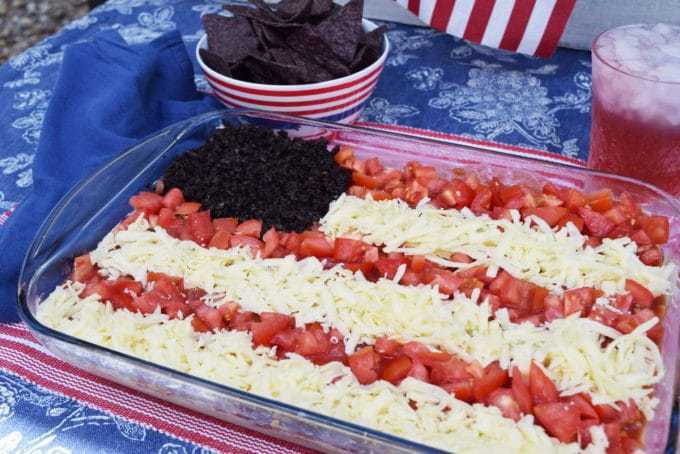 American Flag Layered Dip – a Mexican dip with layers of refried beans, taco seasoning, sour cream, guacamole, salsa topped with cheese, tomatoes and black olives. Perfect for summer patriotic festivities with family and friends. July 4th Celebrations are not complete unless family and friends are gathered celebrating around the table. Now usually, for my family, that table is on the pool lanai as we splash around most of the day. 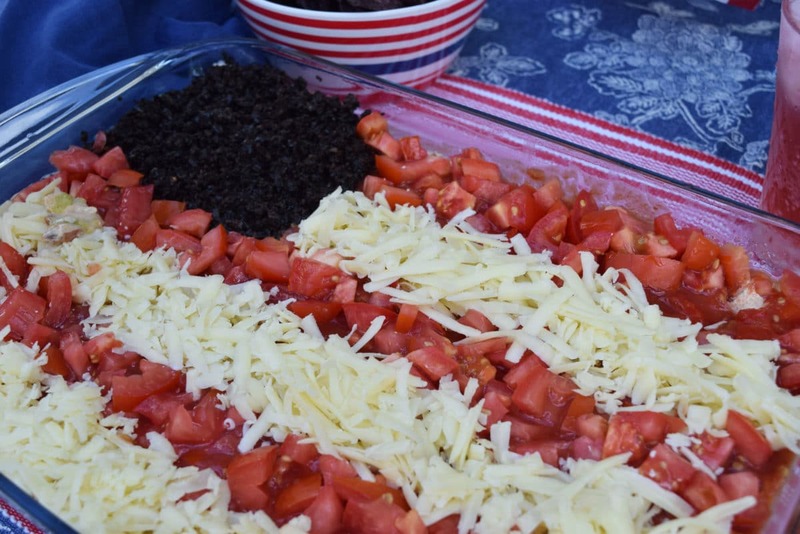 This year we are starting the celebrations with this American Flag Layered Dip and blue tortilla chips. Our table is usually filled with festive food, like this Patriotic Cucumber Salad and Red, White and Blue drinks and dishes galore. What is on your table? Do you do all the cooking or is it a potluck celebration? We are truly blessed to live in the USA and we always celebrate while remembering all those who have served and sacrificed so we can live in this free country! It’s such an honor to be with my family on this day, being surrounded by loved ones. My daughter will be home from college for the week. There is no greater happiness than when my kids and family are all together! Feels like my world is complete again with everyone in the nest! How do you and your family celebrate our great Nation’s Independence?? Stop by and share your celebrations in the comments or over on our Facebook group. We’d love to see what you and your family are up to! 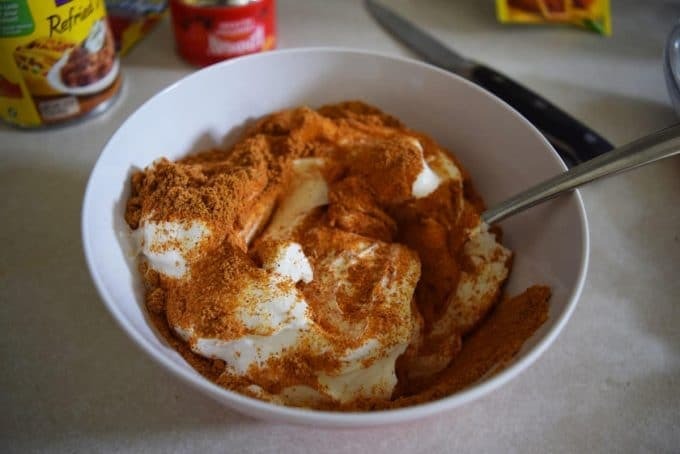 Layer 3 – Mix the Sour Cream and Taco Mix in a bowl and then spread on top of beans. 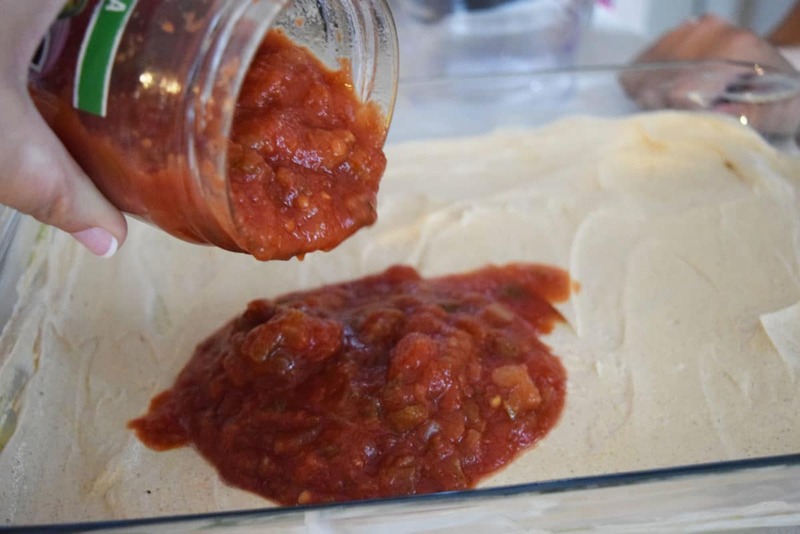 Layer 4 – Salsa – See that sweet hand in the back. My son helping me!! Proud mom. I love him! Layer 5 – Black Olive or Black Beans. I put them in the corner for this one. When I make a regular one they get sprinkled on top. Our table is decked out in Red, White and Blue and we are going to dig into this dip with glad hearts and happy bellies! 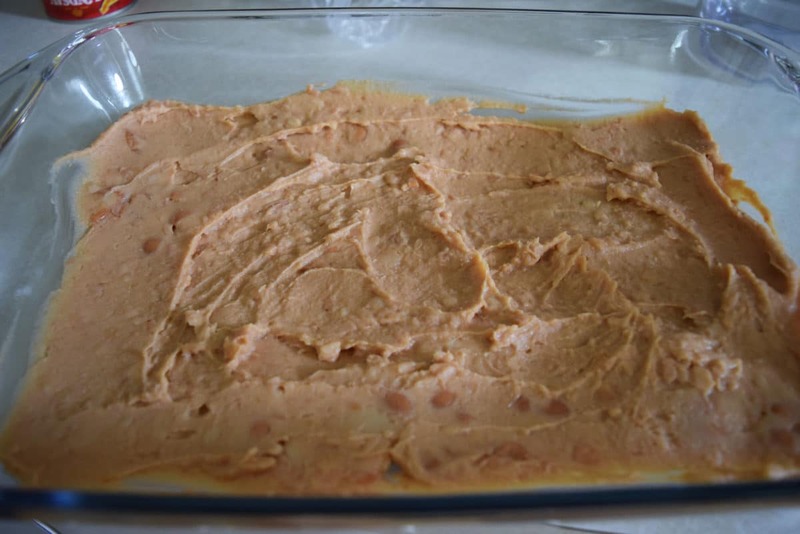 Other Recipes you may enjoy on the 4th or at any BBQ! 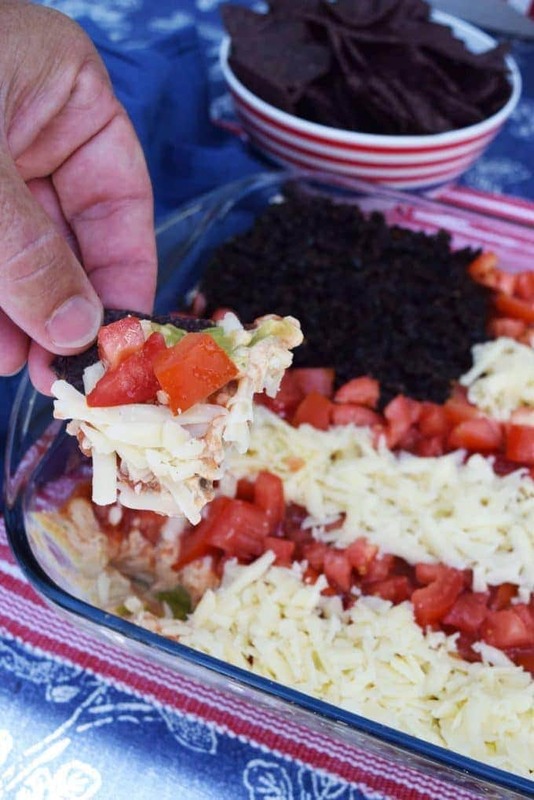 American Flag Layered Dip - a Mexican dip with layers of refried beans, taco seasoning, sour cream, guacamole, salsa topped with cheese, tomatoes and black olives. Perfect for summer patriotic festivities with family and friends. 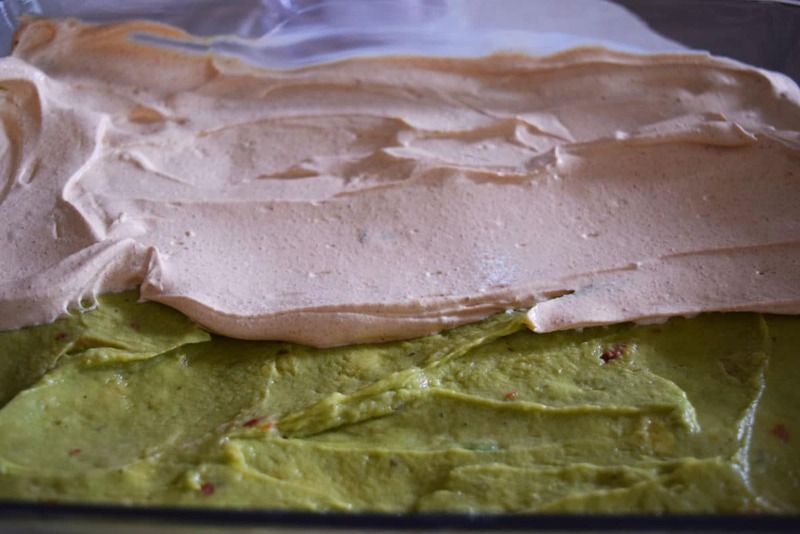 In a 9 x 13 dish layer refried beans on the bottom, spread guacamole on top of beans. In a bowl mix sour cream and taco seasoning, spread on top of guacamole. Pour on salsa. In top left corner place olives for the blue part of the flag. Then alternate lines of chopped tomatoes and cheese to form the stripes. Layers make it extra good! Yes, I agree Cindy! Getting a bite of those layer on each chip! So Yum! Thank you Tara! We ate are weight in this one for the 4th 😉 Hope you have a beautiful week! What a fun dip, Nikki! All my favorite flavors too. Thank you Stacy! They are my favs too! Have a wonderful week!! This always reminds me of summers at the pool. On rainy days we’d play Monopoly and have bean dip, guacamole, and chips. Fun times! Can’t wait to make this and eat it! Thank you Christie!! What a wonderful memory! I think that is what I love most about food is it’s always brings back memories! Have a blessed 4th! 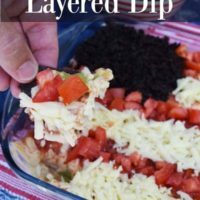 I love layered dips and this one is brilliant! I need to head over to Brookshire’s to see if they have some red, white, and blue tortilla chips! What a super fun way to celebrate the 4th! My family would love this!!! Thank you Carlee! 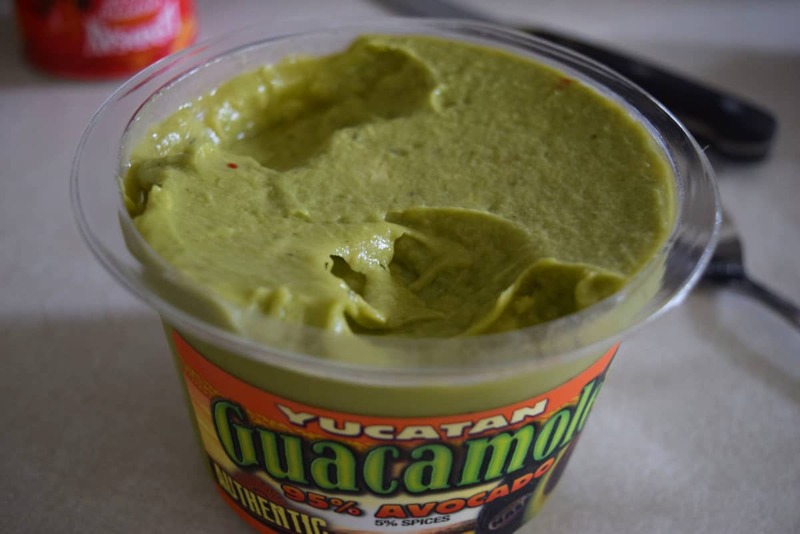 This dip is always a hit! Have a Happy 4th!! Looks like you are all set for a Glorious Independence Day celebration. Wow that is so clever and delicious looking. Love layered dips like these but never would have thought to make it into a flag for the fourth! Thank you Denise! It’s a favorite at our house! Just changed it up a little for the 4th! Enjoy celebrating the 4th!! LOVE this, Nikki!!! The dip is always a winner and creating a flag was genius!! Thank you Liz! It’s always a hit and so easy to put together! Happy 4th Friend! Looks like you’re having the quintessential Independence party, Nikki. How wonderful to have a pool party with your family. AND how lucky to have such a scrumptious dip to enjoy =) Thank you for the recipe! Thank you! A dip in the pool is a requirement in this heat! And this layer dip is always a hit with my family too! Hope you have a wonderful Day!! My husband and I really enjoyed this. I made a half batch and used cherry tomatoes and monterey jack cheese. Super easy to assemble. The only thing I would do different is add the cheese and then add the tomatoes instead of alternating them. Thanks. Thank you!! So glad you enjoyed it! When I make this normally I do just that a layer of cheese then top with chopped tomatoes & sprinkled with chopped black olives. Changed it up with the American Flag look!